Joy, K.J. Kulkarni, Seema Roth, Dik and Zwarteveen, Margreet 2014. Re-politicising water governance: exploring water re-allocations in terms of justice. Local Environment, Vol. 19, Issue. 9, p. 954. 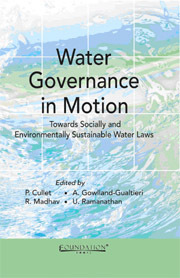 Water Governance in Motion: Towards Socially and Environmentally Sustainable Water Laws focuses on the work undertaken by International Environmental Law Research Centre IELRC on water law reforms in India. It seeks to provide a broader understanding of the conceptual framework informing existing water law and ongoing reforms. The book is divided into two parts. The first part critically analyses the context of international law for water reforms and the second part discusses the multifaceted aspects of water sector reforms in India. It assembles in one volume the contributions made by a broad range of scholars working on various law and policy issues arising in the context of water sector reforms in India. These questions are dealt with from a range of perspectives including human rights, environment, agriculture, development and trade. 8 - Tirupur Water Supply and Sanitation Project: A Revolution in Water Resource Management? 13 - The Right to Water as a Human Right or a Bird's Right: Does Cooperative Governance Offer a Way Out of a Conflict of Interests and Legal Complexity?